Bipolar disorder is a pretty severe condition that affects over 2 million people in the U.S. alone. The severity of the illness can vary from person to person – one thing that is a given is that this condition has a very powerful impact on the person and their immediate family. Mental health issues affect everyone and it becomes imperative to get help in a timely fashion. A bipolar spouse is a huge responsibility. There are several modes of treatments such as the regular medication and therapy sessions. They can also seek spiritual aid. You must encourage them to lead a normal life. You have to be a very tolerant person if your husband is suffering from bipolar disease. It is very hard to initially deal with a husband who is suffering from this disease. However, after learning about some simple ways to tackle such aggressive patients, it becomes possible to deal with the situation as well as the person. People who live with a bipolar spouse more often than not give up the relationship because of the difficulties in handling the mood swings of the affected spouse. It is essential to get a good understanding of the disease in order to cope with the challenges. It is no secret that living with a bipolar spouse has many challenges that at times are quite hard to deal with. It is important that spouses be able to recognize bipolar triggers so that they can avoid situations where the sufferer can have a relapse. Love comes once in life without any conditions. What if love strikes the doors of your life in a very strange manner? It could be very hard for people to deal with the fact that their date is suffering from bipolar disorder. However, it is hardest for the patient to deal with him/her. It might be an awkward situation for you to be dating someone who is suffering from bipolar disorder. However, a small help offered from your side can help the person you are dating to cope well with his/her disease. Dating a bipolar person is not an easy task. It can be a real challenge for a person who is in real love, but it is not an impossible task. 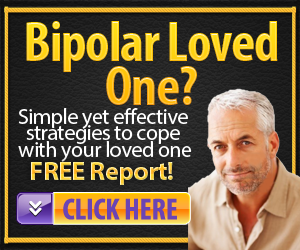 Making a bipolar marriage a success could be the greatest challenge for a married couple. There may be a lot of ups and downs which have to be faced. Bipolar disorder is associated with mood swings and depression. Usually there are specific signs that can confirm this disorder in a person, but it may still be difficult to judge in the case of a woman. Here are few signs to help you understand if your wife has bipolar disorder.